Please get in touch if you are looking for further information on any aspect of producing, creating, maintaining or developing your website, or related online services (such as e–commerce,advertising, etc.). 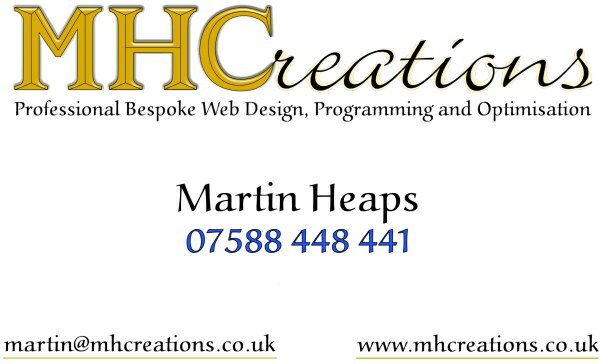 You can contact Martin at MHCreations at any reasonable time via telephone on 07588 448 441 or any time (reasonable or unreasonable) by email to: our usual address. MHCreations prides itself on honest and trustworthy business practices and is pleased to be a member of the Federation of Small Businesses. For secure conversation you can contact us via OpenPGP by downloading and importing our public Key (also personal email key) and using it to send us secured and completely confidential emails. Please remember to attach your own public key when emailing, so we can read your email and reply in kind! We usually respond on the same day and often work evenings and weekends as well as usual office hours. MHCreations can also talk with you via video calling, by arrangement. You can also read the MHCreations Terms and Conditions of service.